Perils of the Perplexing Pyramid is the final level of World 2 in Yoshi's Woolly World. It is unlocked after all forty Smiley Flowers of all other levels of World 2 are collected. The level starts with a night scene, leading into a pyramid with a few Shy Guys. After a cannon launch, Yoshi must eat and spit out a Koopa Shell to be moved to a platform above with a red ! Switch. After moving across the blocks, Yoshi must then catch the shell before it careens off to an unreachable point, then spit it out again before the red ! Switch wears off to hit a yellow ! Switch. This reveals a key, which allows Yoshi to access the locked door. The second room, if backtracked from the access point, starts with a Tap-Tap spawning area. Yoshi must get it across the hole until it hits another red ! Switch. Yoshi must then quickly guide it across again to yet another red ! Switch, followed by another, until it finally reaches a yellow ! Switch, revealing the key and allowing access to the next room. The third room consists of a Monty Mole spawning area. Yoshi must guide the Monty Mole across many lifts to yet another yellow ! Switch, leading to another door. The fourth room at first consists of a coffin with a single Pharaoh Guy coming out of a lift. A nearby flame must be eaten and spit out at it to defeat it for good. After this, a cannon will spawn, sending Yoshi out of the pyramid and back into the open. The goal roulette awaits. Smiley Flower 1: Just above the first locked door, to the right, lies a sponge ceiling. Throwing a yarn ball at them reveals a Present Box, with the Smiley Flower inside. Smiley Flower 2: Just after accessing the first locked door, there is a hidden Winged Cloud just above an Egg Block; hitting it with a yarn ball reveals the Smiley Flower. Smiley Flower 3: Revealed by the second ! Switch, just below four Donut Blocks. Smiley Flower 4: In a hidden Winged Cloud above the final lift in the third room. Smiley Flower 5: In a Present Box inside the coffin containing a Pharaoh Guy. Wonder Wool 1: During the first red ! Switch phase, Yoshi must jump across the red blocks to reach it. Wonder Wool 2: In the second room, in plain sight below some Donut Blocks. Wonder Wool 3: In the third room, in plain sight at the top of the widest lift. Wonder Wool 4: When using the cannon just above the Pharaoh Guy coffin, Yoshi should wait until the Wonder Wool is aligned perfectly with the cannon, then fire. Wonder Wool 5: After being shot out of the cannon leading outside, Yoshi must walk over to the left to find a secret alcove containing the Wonder Wool. 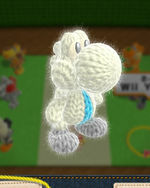 Collecting all of the Wonder Wools knits Wii Yoshi back together. Piramideu'ui Bimileul Puleora! Find Out the Secret of the Pyramid! This page was last edited on October 28, 2018, at 02:44.